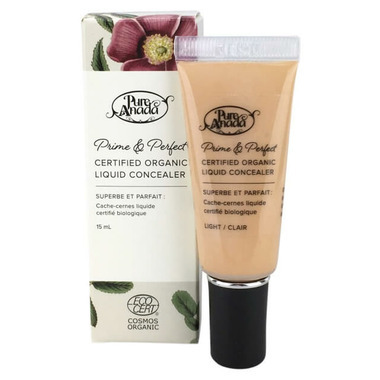 You'll love this certified organic concealer from Pure Anada! Applies like a dream, creating a gorgeously smooth finish while nourishing and restoring elasticity. Usage: As a concealer - disguise blemishes and dark under-eye circles with this non-greasy, full coverage formula. As a primer - apply to eyelids to even skintone and help shadow adhere. 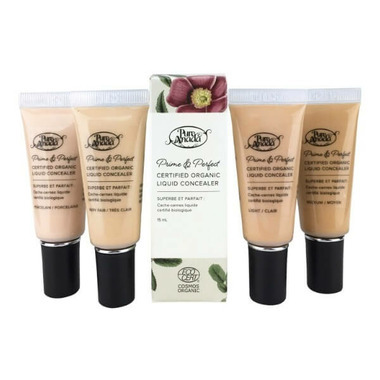 I really wanted to love this concealer, because I love that it's organic and made in Canada. That being said, it really didn't work that well on my undereyes even after layering. I don't mind the consistency, but you need to layer on a lot and because it's slippery it's really hard to do that (when I used a beauty sponge to add more it basically just wiped off the other layer). This concealer is a light liquid mousse type texture. 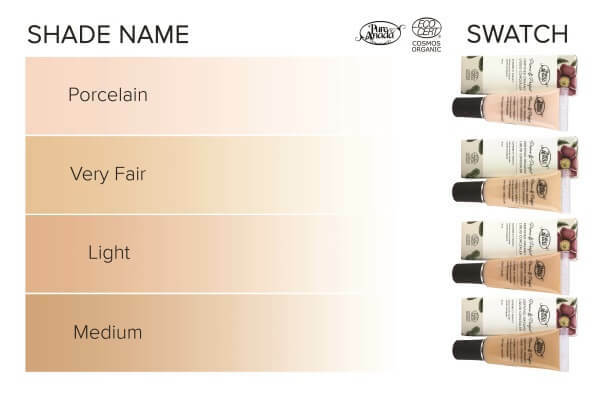 I don't think the consistency is the problem, as there are plenty of super liquid concealers that offer coverage, but the coverage is definitely lacking. It works decent for neutralizing redness, which is mostly what I bought it for. It does cling a bit to dry patches and I find the colour oxidizes. I put some on my hand and it went from a light yellow to a darker orange shade. Great company, ingredients, and price point, but disappointing concealer. A littlebit disapointed, too liquify to provide any coverage. I do not recommend it! I had high hopes for this concealer because I really like their liquid foundation, but as other reviews state, it is too liquify to provide any coverage at all. One of the only Pure Anada products I didnâ€™t love. Itâ€™s okay, but the consistency is more like foundation than full coverage concealer. It doesnâ€™t really build well for me, as it starts to cake before I get good coverage. Iâ€™m using it like foundation with a little mineral powder on top. It doesnâ€™t cover my dark circles at all, which was what I bought it for. Think Iâ€™ll try the stick formula next time. It is a very fluid concealer. I used shade Very Fair (I use their Prairie Rose foundation shade). It has barely any coverage, even after 3+ layers. I very much preferred their stick concealer. Another excellent product ! Blends well and looks very natural . Worth purchasing these great Canadian natural products . I have tan skin, so I took the medium shade. And honestly i'm surprised of this product. Feels great, blends well, looks natural on the skin. Really good purchase! This concealer is quite liquid and you need to build to give coverage. I bought the Light, which is yellowish, which does disappear, but the colour is a bit off-putting. I should have chosen Very Fair. Since the concealer is quite fluid, I have used it to cover some rosacea. The consistency feels more like a foundation than concealer. I have another concealer from a different manufacturer that I prefer more than this one. I just purchased the new liquid concealer and I absolutely love it! I am so happy this has come out and I am adding it my list of every day essentials. I was a little worried because it didn't quite match the colour of foundation I use...(I got very fair because my foundation also says very fair on it...I use prairie rose.) But it actually blended in really well and covered all the blemishes that I wanted! Let me tell you, if your makeup routine consists of Pure Anada foundation, liquid concealer, blush, and mascara, then you are good to go!! I am so so happy with this brand and everything about it!